Micrometric and sub-micrometric contaminant particles—what most of us call "dust"—can cause big problems for art conservators, the electronics industry, aerospace engineers, and others. These nanoparticles can prevent a cellphone from working or rob the vitality of a painting's colors. Drawing from the forces of static cling and the science behind gecko feet, the lab of Yale School of Engineering & Applied Science Dean T. Kyle Vanderlick has developed a promising tool in the war on dust. The results appear in the journal ACS Applied Materials and Interfaces. Hadi Izadi, a postdoctoral associate, is the paper's lead author. Vanderlick's lab, which focuses on thin films and surface properties, took on the dust problem shortly after Yale established art conservation labs at its Institute for the Preservation of Cultural Heritage (IPCH) at the Yale West Campus. Vanderlick said the project is particularly characteristic of Yale, where collaborations between disciplines are strongly encouraged. "This wouldn't have happened without the art scientists and conservators at the IPCH working with the researchers in our lab," she said. "Acrylic paints are incredibly porous, so anything you're putting on the surface could get into the pores, and then work from the insides of the pores to soften the paints," Schwarz said, adding that the new technology has the potential to solve this long-standing problem. If dust particles are bigger than 10 micrometers, removing them can be achieved with minimal fuss, usually with an air jet or nitrogen jet. It's a whole other world of trouble for particles less than 10 micrometers. There are plenty of methods of removal, but each has its drawbacks. Wet cleaning is limited in its ability to remove particles, and can possibly damage the object being cleaned. In recent years, the electronics industry and art conservators have turned to dry cleaning techniques, such as lasers, micro-abrasive particles, and carbon dioxide snow jets. They remove dust well, but can be just as damaging to artwork as wet cleaning methods. The Yale researchers' solution is deceptively simple. In the lab, Izadi holds up what looks like an ordinary plastic sheet. It's actually an elastic and non-sticky polymer, polydimethylsiloxane (PDMS). Put it under a microscope, and you can see millions of tiny columns. Depending on the size of dust particles you're removing, the pillars range from 2 to 50 micrometers in diameter—bigger particles require bigger pillars. Izadi is very familiar with fibrillar structures and micropillars. His previous research explored the mystery of how geckos effortlessly stick to walls. 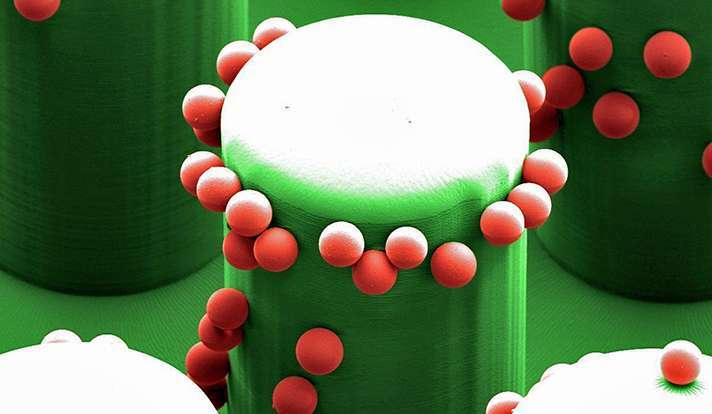 It turns out that a lot of it has to do with electrostatic charges and the microscopic pillars on the pads on their feet. Applying some of this science to cleaning microparticles made sense, he said. "When you're talking about dust, you're talking about electrostatic charges." The micropillar structures used for dust cleaning, however, differ from those of geckos in that they're designed specifically not to stick. The PDMS polymer has minimal interaction with the substrate—whether it's an iPhone or a sculpture—but it produces enough electrostatic charge to detach the dust particles. Although her lab is new to art preservation, Vanderlick noted, there's much to engage researchers in her field. "Dust is something at the nanometer level," she said. "And there's a lot of interesting thin film, surface, and interfacial physics associated with the preservation of art."